A RARE Antique High Quality TAHAN 'Boulle' Work and Mother of Pearl Perfume Casket and Original Key. Bass-inlaid Boulle and Mother of Pearl Marquetry Decorate the Rectangular Casket. The Interior of the Casket is Comprised of Three Compartments that Hold Original Gilded Perfume Bottles. 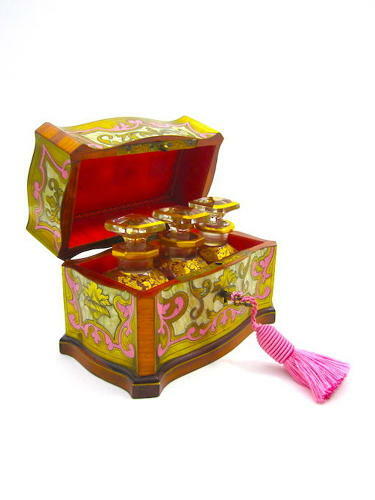 Each Perfume Bottle is Hand Decorated with Gilded Flowers and Scroll Work. Boulle Work is a Type of Marquetry of Patterned Inlays First Used by Andre Charles Boulle in the 17th Century.